Web servers can frequently be found embedded in devices such as printers, routers, webcams and serving only a local network. The web server may then be used as a part of a system for monitoring or administering the device in question. This usually means that no additional software has to be installed on the client computer since only a web browser is required (which now is included with most operating systems). The world's first web server, a NeXT Computer workstation with Ethernet, 1990. The case label reads: "This machine is a server. DO NOT POWER IT DOWN!!" 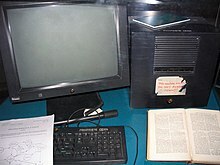 Between 1991 and 1994, the simplicity and effectiveness of early technologies used to surf and exchange data through the World Wide Web helped to port them to many different operating systems and spread their use among scientific organizations and universities, and subsequently to the industry. In 1994 Berners-Lee decided to constitute the World Wide Web Consortium (W3C) to regulate the further development of the many technologies involved (HTTP, HTML, etc.) through a standardization process. For a static request the URL path specified by the client is relative to the web server's root directory. The web server then reads the file, if it exists, and sends a response to the client's web browser. The response will describe the content of the file and contain the file itself or an error message will return saying that the file does not exist or is unavailable. 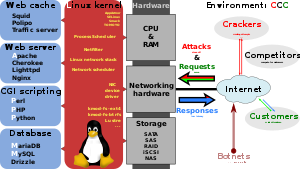 A web server can be either incorporated into the OS kernel, or in user space (like other regular applications). Web servers that run in user-mode have to ask the system for permission to use more memory or more CPU resources. Not only do these requests to the kernel take time, but they are not always satisfied because the system reserves resources for its own usage and has the responsibility to share hardware resources with all the other running applications. Executing in user mode can also mean useless buffer copies which are another handicap for user-mode web servers. 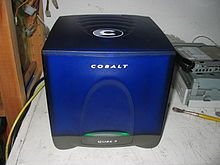 the hardware and software limitations of the OS of the computer on which the web server runs. When a web server is near to or over its limit, it becomes unresponsive. Web servers (computers) partial unavailability. This can happen because of required or urgent maintenance or upgrade, hardware or software failures, back-end (e.g., database) failures, etc. ; in these cases the remaining web servers get too much traffic and become overloaded. Requests are served with (possibly long) delays (from 1 second to a few hundred seconds). The web server returns an HTTP error code, such as 500, 502, 503, 504, 408, or even 404, which is inappropriate for an overload condition. The web server refuses or resets (interrupts) TCP connections before it returns any content. In very rare cases, the web server returns only a part of the requested content. This behavior can be considered a bug, even if it usually arises as a symptom of overload. Using more efficient computer programs for web servers, etc. Below are the latest statistics of the market share of all sites of the top web servers on the Internet by W3Techs Usage of Web Servers for Websites. All other web servers are used by less than 1% of the websites. Below are the latest statistics of the market share of all sites of the top web servers on the Internet by Netcraft February 2017 Web Server Survey. Below are the latest statistics of the market share of all sites of the top web servers on the Internet by Netcraft February 2016 Web Server Survey. 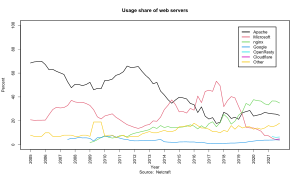 Apache, IIS and Nginx are the most used web servers on the World Wide Web. ^ Patrick, Killelea (2002). Web performance tuning (2nd ed.). Beijing: O'Reilly. p. 264. ISBN 059600172X. OCLC 49502686. ^ Zolfagharifard, Ellie (24 November 2018). "'Father of the web' Sir Tim Berners-Lee on his plan to fight fake news". The Telegraph. ISSN 0307-1235. Retrieved 1 February 2019. ^ "History of Computers and Computing, Internet, Birth, The World Wide Web of Tim Berners-Lee". history-computer.com. Retrieved 1 February 2019. ^ Macaulay, Tom. "What are the best open source web servers?". ComputerworldUK. Retrieved 1 February 2019. ^ Fisher, Tim; Lifewire. "Getting a 502 Bad Gateway Error? Here's What to Do". Lifewire. Retrieved 1 February 2019. ^ Fisher, Tim; Lifewire. "Getting a 503 Service Unavailable Error? Here's What to Do". Lifewire. Retrieved 1 February 2019. ^ "What is a 502 bad gateway and how do you fix it?". IT PRO. Retrieved 1 February 2019. ^ Vaughan-Nichols, Steven J. "Apache and IIS' Web server rival NGINX is growing fast". ZDNet. Retrieved 1 February 2019. ^ Hadi, Nahari (2011). Web commerce security: design and development. Krutz, Ronald L. Indianapolis: Wiley Pub. ISBN 9781118098899. OCLC 757394142. This page was last edited on 17 April 2019, at 11:17 (UTC).